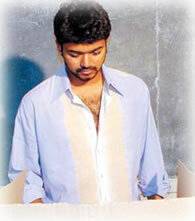 Tamil movies : 'Thala' and 'Thalapathy' serious about elections!! If there is one good thing that all our film stars do regularly, it is the casting of their votes during elections. This election season too saw a galaxy of stars, joining the queue of patient voters at different places in the city, like dutiful citizens, to exercise their franchise. Such occasion also happens to be a good photo opportunity for the eager beaver photographers and of course, also for the TV crew who are always hungry for a few minutes of footage. The first one to be spotted was Vijayakanth at the Kaveri Rangan School at Saligramam. Speaking to the media who had gathered there Vijayakanth said, “A silent revolution is going to take place, which you will know once the results are out.” He left immediately for Vridhachalam, from where he is contesting. Saligramam’s star voter Ilaya Thalapathy Vijay came to polling booth to cast his vote, along with his father SA Chandrasekhar, wife Sangeetha and mother Shobha early in the morning. Another star to arrive at the earliest was Actor Ajith - in his new pony-tailed look- at Government School at Kuppam Road near Thiruvanmayur. He came around 7.30 am to avoid the distractions from his fans. Khushboo and her husband Sundar C, went to the Government High School at R.A. Puram at around 8 am and cast their votes. 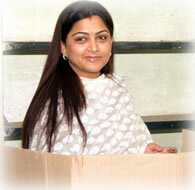 There were quite a few murmurs among the voters about the way Khushboo was allowed to jump the queue. At 8.30 came Sneha, along with her sister, at the Research Foundation booth at Teynampet. She had taken a three-day break from her shooting so that she could be in Chennai at the time of elections. At 10.30 am actor Suriya came along with his brother ‘Paruthiveeran’ Karthi and his father ‘evergreen’ Sivakumar to vote at the Hindi Prachara Sabha in T.Nagar. Hindi Prachara Sabha saw another celebrity voter around noon and this time it was director Shankar. It was said that Rajini, Shankar and Raju Sundaram had rushed from their shooting at Hyderabad to Chennai especially for voting. Preetha Vijayakumar and her director husband Hari too arrived around the same time. Actor couple R. Sarath Kumar and Radhika, much in the news recently for changing camps, turned up at around 11.30 a.m. to vote at Nellai Nadar School in Kottivakkam. Comedian Vivek was spotted at Jai Gopal Garodia School around 12 noon and upcoming actor Arya was seen in the Valliammal School voting booth at Anna Nagar. Kollywood stars may have their share of critics but one thing you can’t them accuse them of is not participating in the democratic processes of the country. The fact that the stars were able to make it to the voting booths, despite having busy schedules and travel engagements planned long before, should come as a heartening piece of news even to the most diehard critics of the film world.